October 7-13 marks Fire Prevention Week. If you haven’t reviewed fire extinguisher training for your employees lately, now is the time. October 7-13 marks Fire Prevention Week. If you haven’t reviewed fire extinguisher training for your employees lately, now is the time. Here are some reasons why it’s essential that your employees know what to do when they need to use a fire extinguisher. Properly training your employees how to use fire extinguishers is encouraged by the Occupational Safety and Health Administration (OSHA). Take time during Fire Prevention Week to go over what to do. Employees can be trained and certified to operate fire extinguishers on smaller fires while everyone else evacuates the building. The training doesn’t have to be extensive – it can be an instructional video, some discussion, or reading documentation. It depends on how you design your fire safety plan. 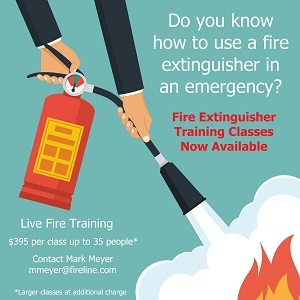 Fire protection companies often offer fire extinguisher training classes that teach your employees about fire extinguishers while giving them hands on experience. If you have employees who are specifically tasked with using fire extinguishers according to your safety plan, then they need more thorough training that includes practice with the extinguishers. In an emergency situation, good training can overcome the instinct to panic. Training your employees to use fire extinguishers correctly ensures they will know what to do when confronted with a fire. They can also determine which fire extinguisher to use, along with the techniques to activate the extinguisher and how best to target the fire using the PASS method. Fires can cause injury and death to anyone in your building. By giving your employees the training they need, they won’t injure themselves while using the fire extinguishers. Sometimes, the best way to avoid injury is to escape the fire. The right training will also teach your employees to recognize when the situation becomes too dangerous for them. Safety training is a crucial part of providing your business with necessary fire protection measures. A fire extinguisher can also prevent damage to your assets and your premises. Stopping a fire before it can grow out of control is essential for avoiding the loss of your business due to fire damage. This entry was posted on Wednesday, October 10th, 2018 at 11:26 am. Both comments and pings are currently closed.